Roland Fishman’s Writer’s Studio is one of the quiet success stories of Sydney. Ever since the journalist-turned-author began running classes in his Bondi living room 20 years ago, he has steadily helped more than 20 novels and screenplays get published, as well as seeing thousands of people rediscover the power of their imagination. He was in his mid-30s at the time, and it saddens him it took so long to get back in touch with his own creativity. “It felt like I was finally doing what I was meant to be doing when I grew up,” he says. As an only child growing up in Newport he was a bookworm, constantly reading comics, classics and adventure stories about samurai warriors and ninjas. His companion during the long imaginative games he played was Ted Fishman, a bear with a scout cap and a stout heart. 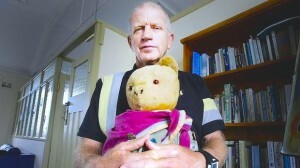 Despite having had his left arm sewn back on several times, Ted is the one object Roland would never part with, because he connects him to the freedom of his childhood and his late mother, Joan. Roland, whose first novel, No Man’s Land – A Russell Carter Thriller, was published last month, says he wished he’d done the Writers’ Studio Four Week Unlocking Creativity Course at high school and would love to offer the course at schools. Note: Ted is now sitting in his chair at the Writers’ Studio keeping an eye on me and those doing our live classes. He loves hearing people’s stories.